The small moons of the outer solar system were once posited to be boring, lifeless, cratered ice balls. Barely worth scientific consideration … unless counting craters was your thing. Gerard Kuiper found an atmosphere on the moon Titan back in 1944. Exciting, but not too surprising; Titan is about the same size as the planet Mercury. And being a lot colder, it will hold on to atmospheric gases in a way Mercury cannot. Io’s volcanoes were first espied by Linda Morabito during the 1979 Voyager I mission. Its companion, the second Voyager, sent images of black nitrogen geysers ten years later from Neptune’s moon Triton. Astronomers’ expectations weren’t too rattled: these are all big moons, comparable in size to our own moon. Not too much of a stretch for the imagination. The discovery of ice geysers on the small moon Enceladus seems still to puzzle scientists. Enceladus is indeed small compared to these other moons. It’s smaller than Alaska. Dozens of Enceladuses could fit inside our own moon, were it hollow. Some observers are quick to point out that these cryovolcanic (ice volcanoes) moons are all near a large planet. But that proximity alone isn’t enough to raise their temperature. Active moons (except for Triton) possess a slight eccentricity in their orbits. 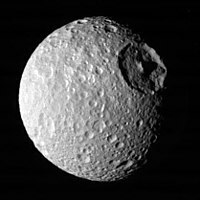 That allows them to get a bit closer and a bit farther away from other nearby moons, permitting some of that tidal action to work its magic. If a moon of a giant planet had an eccentricity of 0, its orbit would be perfectly circular. If there were no other moons in the system, and if the tidal lock of the moon’s rotation were in place, there would be no volcanoes. This is Saturn’s yin-yang moon: one hemisphere bright as snow, the other dark as coal. We’ve not yet detected outgassing of ice or other materials, but Iapetus is also pretty far away from Titan and the other moons. Cassini isn’t getting really close to this innermost large Saturnian moon. It’s about half the size of Enceladus, and while its cratered surface looks a bit smoothed out to me, we won’t get a good look at it to be sure. An ocean beneath that smooth crust is pretty much conceded, even though the direct evidence has yet to surface. The Galileo probe found tectonic activity similar to icepack behavior in Earth’s polar regions. This moon, too, has a subsurface ocean, but Ganymede would be the main third party in any gravity tugs-of-war. Ice geysers: check. 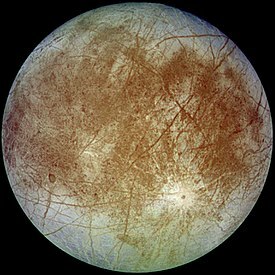 A smooth surface like Europa’s: check. 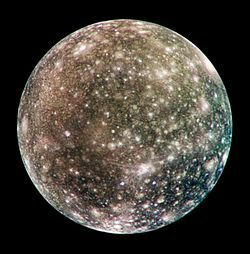 Some global mechanism has erased the craters that Callisto exhibits from the early days of the solar system. Probably not the only volcanic moon in the Saturn system. Lots of sulfur-spewing activity. 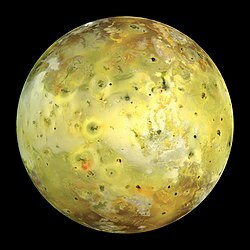 Io is the most volcanically active body in the solar system. That we know of. The middle (third of five) large moon of Uranus got a quick glance from Voyager II in 1986. Unlike Europa and Enceladus, it’s dark–the darkest of the Uranian major moons. Some astronomers assume that the moon’s dark color and cratered surface tags it as geologically dead. I’m not so sure. That orbital eccentricity is close to Io’s and Enceladus. It’s neighbor moons are a bit larger than those of Enceladus. And we’ve never glimpsed the entire southern hemisphere of the moon. Those bright patches are dismissed too easily as crater ejecta. It took the sharp images of Cassini to determine the frosty wisps on Dione were really cliffs. And Enceladus has a whole southern hemisphere of smooth plains and tiger stripes. Maybe Umbriel does too and we missed it. The molecules in its orbital neighborhood have been traced to this moon. It might not be spewing geysers like Enceladus, but something significant may be going on there. I’ve posted on this possibility a few times before. 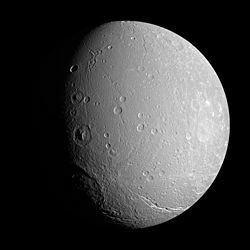 I probably won’t ever see my suspicions of Umbriel and the other Uranian moons verified, but it’s likely we’ll find out a bit more from Dione and other Saturnian moons before Cassini’s finished.